Edgar Cayce gave many readings on attunement tools for spiritual healing used in Atlantis and Ancient Egypt. According to Edgar Cayce, the inventions were unique because they created an invisible spiritual force. Edgar Cayce said the inventions operated on light, but the invisible force they created was not light. 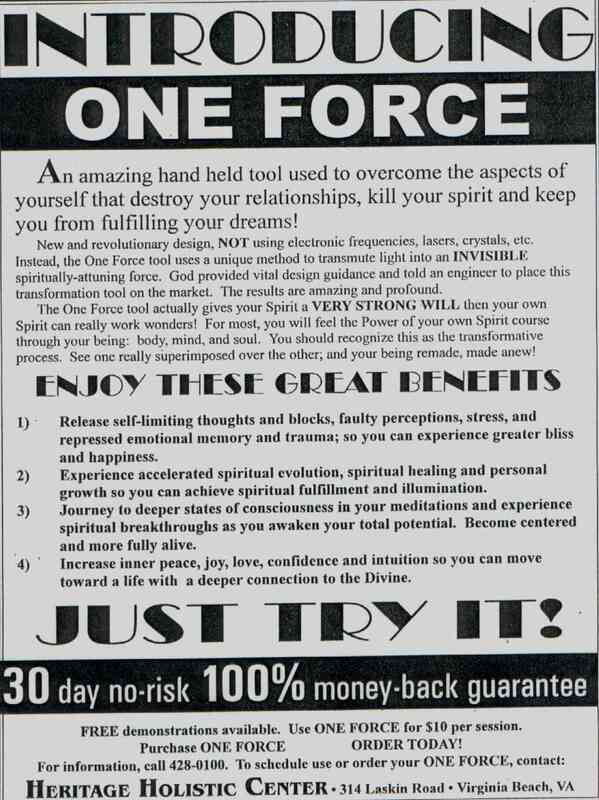 The One Force inventions are using this unique technology that creates an invisible spiritual force. God provided vital design information to an engineer to produce the One Force inventions, and told him to place the inventions on the market. At ARE Congress Week, we lectured on and allowed many ARE members to try it. Everyone is very skeptical until they try it themselves. Many ARE members bought it. We offer a 30 day no risk 100% money-back guarantee, yet 94% of the people keep it. That is excellent for any product. "I experienced a feeling of deep relaxation and serenity that I have only felt during meditation. I was also aware of energy movement in the form of a tingling feeling from my knees to my crown chalkra. It was definitely a wonderful and centering experience!"